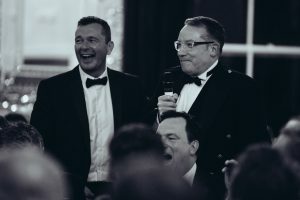 Last Thursday evening saw an exclusive evening at Exeter Castle held by private banking firm Arbuthnot Latham in association with Stephens Scown solicitors. 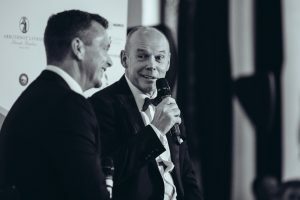 The occasion was billed as ‘An Evening with Sir Clive Woodward’ with Sean hosting the Q&A sessions with Sir Clive and the audience. The evening was in aid of two local charities :- Royal Devon 7 Exeter NHS Foundation Trust and Surfers for Sewage & Plastic Free Exeter with former Exeter Chief player Chris Bentley undertaking the charity auction which included a VIP package to watch England v New Zealand in November and a signed Dan Carter shirt. Sean asked Sir Clive about his latest venture – Apex 2100 – a snowsport academy and school based in Tignes, France, as well as discussing all about the Hive Learning community developed by Sir Clive. 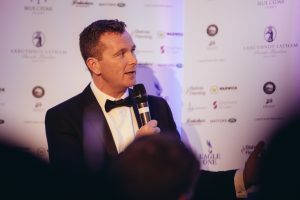 His Rugby World Cup winning experience was high on the agenda too as the audience sought to extract stories of players and memories of his successful coaching career. Also in attendance was Rob Baxter, Head Coach of Aviva Premiership Champions, Exeter Chiefs.